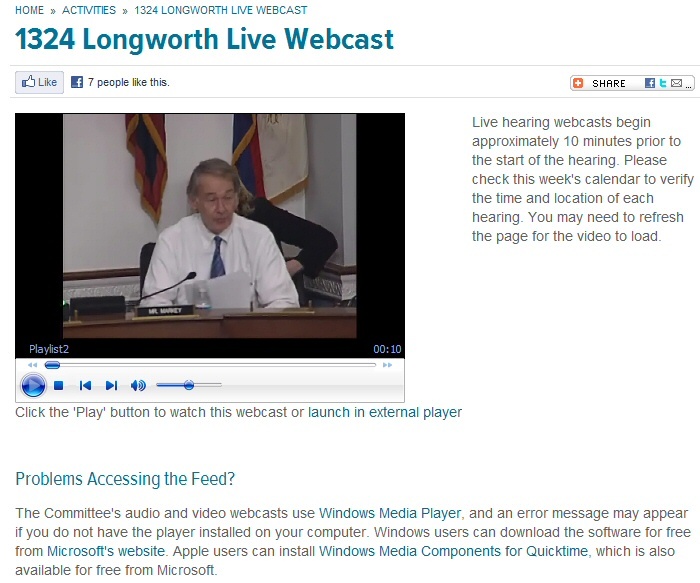 Live Webcast of Waxman Markey circus | Watts Up With That? Windows Explorer recommended – it uses Windows Media Streaming format, plugins required for Firefox and Chrome etc. So, is Nostrildamus predicting the future again? 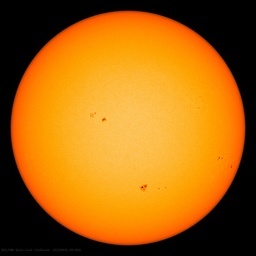 We’re all going to perish from AGW unless we act now now now! I’m sort of hoping that this can be downloaded after the fact. Usually they are embedded and not so easily downloaded (without say Orbit Downloader, or some such). Any suggestions on (after the fact and posted at a *.gov website) downloadable options would be greatly appreciated. Given that that this is a D’s show, will the R’s have a counterstrike (at some future date)? Note, I happen to think that all congressional hearings are circuses, or witch hunts, of one form or another. Answer the question, Dr Santer. “our best understanding”???? Muller needs to spit out his foot….soon. I watched for about :30 until Santer began of the “human fingerprint” of warming and CO2. You are seeing an echo chamber on display. Windows Media Streaming format? Not very bright, are these jokers. What do we really know about DNA? Is Waxman descended from meerkats? Muller got a softball interview this am on MSNBC’s Morning Joe. I posted several quotes from that interview over in the “Tips and Notes” section. Largely the narrative pro-AGW media wants – the couple of concessions he made are largely glossed over. Sorry, it must be my screen. They are sitting from left to right in how strongly they were willing to commit to the human fingerprint. Muller said pretty categorically that their studies prove the world was warming but repeatedly stated that the amount of this due to humans is subject to much debate. The guy on the right, however, was a rabid alarmist from the get go. Muller also mentioned that whatever we decide to do as policy is mitigated by what India and China won’t do which brought the political response that if the US leads in green technologies we can provide this (at a profit?) to the 3rd world. Also, the congressman tried to bash down other types of causes like cosmic rays for climate change and quoted his selected studies to show that it all has to be human caused, but he did not get the full agreement with those seated except the guy on the right. Given the choice of the 3 scientists did not agree with each other and only the most rabid of these 3 agreed with our representatives, I’m not sure they got what they were expecting from this panel. They also mentioned the theme that the CO2 we are putting in the atmosphere today won’t reach it’s full effect for 30 years. This sounds extremely familiar to the wattsupwith that article from today about leaks from the IPCC’s next paper. Sounds like that’s going to be the fall back position. It’s not warming now but it will in 30 years. Gotta love it! Ah, the High Priests of Global Warming. With a priestess in the background. Telling the common man to repent. I don’t even get this thing started – cannot see nor hear anything. Have the win player installed ok, but nada happens… Que? The constant stream of put-downs of Republicans, skeptics and deniers while sitting in our Congress made me really sick. Get rid of them all ASAP! Vote them out, defund them, get them fired, any and all will do. Really a lot of nonsense. Since Muller wouldn’t agree that there was a human footprint from his data, then why was he agreeing that there needs to be a “solution”? A solution to what? Natural warming of a slight degree over 100 years? Per the guy on the right — why is it “prudent” to run the economy into the ditch based on the conclusions of the scientists, when the scientist two seats to his left was saying he can’t discern human a footprint? Santer talking about the Climate-gate letter writers in the third-person was a laugh, too. I doubt the dumb congress-critters know that Santer’s letters we’re some of the most obnoxious — clearly Santer didn’t tell them. I thought Markey would pitch a fit when Muller talked about the technologies needed to be invested in for green energy and listed “nuclear energy”. Didn’t Muller’s panel get the memo that Markey is rabidly anti-nuke? That he rode the coat-tails of the Massachusetts “clamshell alliance” anti-nuke crowd to get into office, and that the nuke-haters are his most reliable constituency? It shows how ham-handedly this agitprop was scripted. The scene reminded me of when a sham congressional “committee” of breakaway democrats staged a hearing (and invited the media) to impeach George W Bush, and they had to stage the hearing in a broom closet because they weren’t authorized to use a real room. They also mentioned the theme that the CO2 we are putting in the atmosphere today won’t reach it’s full effect for 30 years. ah yes, that silly little matter of the CO2 “residence” time – the IPCC estimate differs from all 36 other studies by around 1000%. Scroll down to the picture but read the whole article, written by my pinup would nominate for Nobel Prize if I could Prof. Segalstad again. 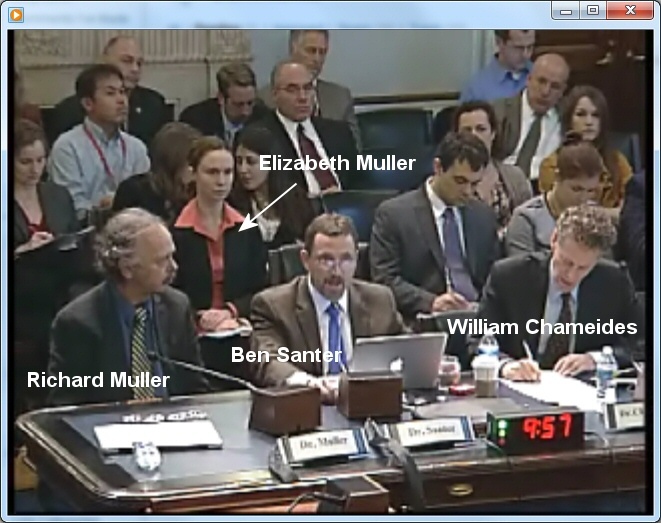 How much of Muller’s recent stagecraft has been to further his daughters job ambitions? We would all do just about anything for our children, surly there is a conflict of interest here? PS) I’m glad Muller made it clear that he was still skeptical about man-made CO2 being the cause of global warming. See, 4 years and 100 years. They have thought about this! Couldn’t get any webcast. Hope that a recording, or someone’s precis, becomes available to us non-Americans – assuming that’s why I couldn’t get it. The whole thing reminds me of a couple scenes from Ghostbusters. Except the testifiers forgot to mention the 3 million registered voters. My favorite part was the last 25 minutes when every time Muller began to address doubt about some aspect of man’s contribution to warming, Santer’s finger,which was barely in frame, began to twitch. I was waiting for Santer to pop up and coldcock Muller. Also of note was Markey cutting off Muller and changing the subject as soon as “climategate” was mentioned by Muller. All in allI think Markey’s attempt to bring the, “End of Climate Change Skepticism” came off more like Evel Knievel’s attempt to jump the Snake River Canyon. I’m sort of hoping that this can be downloaded after the fact ……………..
As far as getting the content, it depends on what you’re using. The FF plugin is just click, click…. done. I haven’t heard anything about a R counter, but, this D display probably isn’t going to gain much attention in the mainstream. Isn’t Waxman from California? Oh that explains everything. I apologize to those few sane Californians that take offense there must be a few sane ones left. Prof. Selesgard is confusing CO2 residence time with adjustment time. …See, 4 years and 100 years. They [IPCC] have thought about this! IPCC have “thought” about a lot of things. So has prof. SEGALSTAD. With the difference that IPCC is a spoiled brat accountable to nobody. Given the obvious ability of the biosphere to sequester CO2, with annual turnover in spades greater than our emissions rate, and the oceans annual turnover likewise an order of magnitude greater than our emissions, I call BS on this IPCC “thought”. No, their isotope argument is not evidence either. I can’t be bothered to find more references at this point – though they are there and I’ve seen them. I think commonsense should be enough to alert us at this point. CO2 emissions from the “developed world” have dropped significantly since 2008 due to purely economic reasons, i.e. the recession. This drop does not appear in the global CO2 levels. If the rise in CO2 levels is purely anthropogenic, why is the drop not obvious? Who is that sitting behind William Chamiedies? is it Mr Bean? > If the rise in CO2 levels is purely anthropogenic, why is the drop not obvious? Because the drop is wiped out by the even greater increase in emissions from India and China. The high priests of climate change and bad public policy will grant indulgences now and in a few hundred years there will be pardons for the unbiased climate scientists if any survive the current purges.